Check out this review of 48hourslogo – one of the fastest and affordable crowdsourcing design platforms. Overview, pricing and features vs the competition. This 48hourslogo review aims to help you figure out if this is the right option for your design needs, and really depends on what you’re looking for. This no-frills company offers one option: crowdsourced design competitions for logos and branding materials. The strength of these design contests is that they allow you to receive ideas from multiple designers rather than just one, and that provides more choices, often for a lower cost. 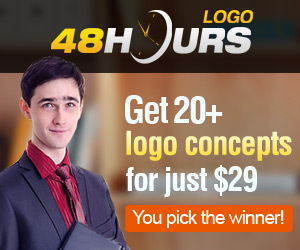 In the case of 48hourslogo, you can also get your designs in less time, as their competitions tend to be much shorter than other sites. They may not have the same depth as other design sites, but this is definitely an efficient option for getting your new logo. One of the newer sites in crowdsourced design, 48hourslogo was launched in 2010 with the goal of offering high quality design for a lower price than the competition. As of January 1, 2017, they had worked with over 40,000 customers on logos and branding materials and produced more than three million unique logos through their competitions. 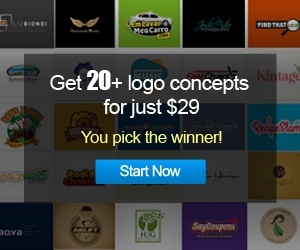 48hourslogo contests start out pretty similarly to most design contest sites. You will need to write a brief, which includes offering a description of what you’re looking for, picking a few logos from your industry that appeal to you, and choosing your price package. You have the choice between a guaranteed contest (in which you pay for everything up-front) or an un-guaranteed contest (for which you only pay $29 initially), but you should know that guaranteed contests attract more submissions. Qualifying stage—This is the part where any registered user can submit designs based on your brief, but you are the only one who can see them and provide feedback (lasts 1-7 days depending on your contest parameters). Design revisions stage—To enter this stage, you have to select up to three finalists for your competition. They will now be able to see each other’s work and can tweak their designs based on your feedback for up to one week. Finalization stage—Once you select a contest winner from among the finalists, you can request a few last changes, and then your designer will upload the file package for you. It will include a high res JPG, a PNG with transparent background, a PDF, an EPS, and a readme for font and color. When it is downloaded and confirmed, the prize will be released to the designer, and you will take ownership of the copyright. You can also buy other designs at this point for reduced prices (usually $50-100) by negotiating with the designers. 48hourslogo is the most basic option out there for crowdsourced design. This is the site with the fewest options and the cheapest prices you’re going to find, and their designer pool is smaller than the more sophisticated sites, but that doesn’t mean that this isn’t a good option for certain situations. If you just need a logo or basic branding designs, and you’re on a tight budget or a short timeline, 48hourslogo can provide you with a selection of professional designs to meet your needs. If you’re looking for the absolute best product or you want a wider range of options, you’ll get more choices and more prestigious designers from the more expensive and extensive sites. Also, at the time of writing this 48hourslogo review, they are offering a special deal to The Crowder visitors which will allow you to upgrade your contest to a “Featured Contest” without paying the extra fee! I used this site for a basic logo for my new site. It’s definitely much cheaper than the rest, but the variety and quality is a little lower. I actually got a good result eventually, so can’t complain. It’s definitely the cheapest option out there. We got good service and a good logo at a reasonable price.